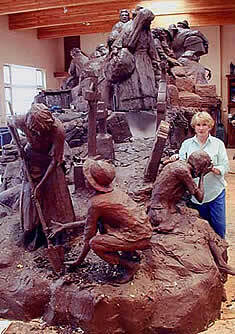 Glenna Goodacre at work on her clay model of the monumental "IRISH MEMORIAL" that portrays Irish immigrants landing in America. To commemorate the 150th Anniversary of the Great Hunger, a committee of prominent Philadelphians from business, government, and the arts commissioned a monument to the Irish who perished and to those who survived, immeasurably enriching the history and culture of the United States. This monument is called the Irish Memorial. 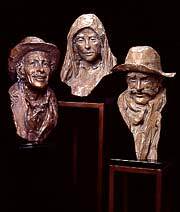 In a 1997 international competition, Santa Fe artist Glenna Goodacre was unanimously selected as the winning sculptor for the Irish Memorial. On March 13, 2000, the Irish Memorial Committee held a ceremonial contract signing for the monument's commission. This event, which took place at the Plough and the Stars Restaurant in Philadelphia, marked the official beginning of the project, and Goodacre received the first installment of her payment. 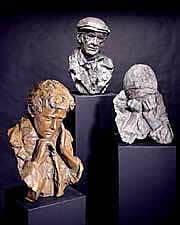 She then embarked upon sculpting the Irish Memorial, which was a two year project. The piece was permanently installed in early February 2003 and the formal dedication occured in October 2003 with the completion of the surrounding park. The Great Hunger was a tragedy that led to the single greatest loss of life in Europe between the Napoleonic Wars and World War I.The Irish potato famine began in 1845 and affected other European countries. But in Ireland, the crisis took place in an economic, political, and social framework that was oppressive and unjust. Ireland and her people endured a disproportionate share of suffering. 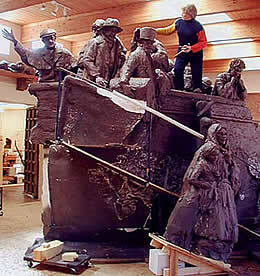 Glenna Goodacre at work on her clay model of the monumental "IRISH MEMORIAL." 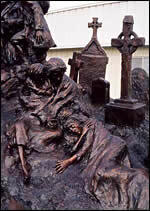 that portrays the toils, hunger and death of the Irish during The Great Famine. When the blight struck, 75 percent of Ireland's tillable land was devoted to growing grains, such as barley, corn, oats and wheat, almost all of which was exported. Likewise, the cattle, pigs and sheep were not eaten by the Irish but sent to Great Britain. All of this food was sufficient to feed the Irish people several times over. Because of the mandatory exporting, as well as an 1847 British legislation that facilitated eviction of Irish tenants by their landlords, a million Irish starved to death, and another million were forced to flee Ireland. This amounted to the loss of almost a quarter of that country's population. The Irish immigrated to the British Isles, Australia, Canada, the United States and elsewhere. The overwhelming immigration was to North America. Those who managed to survive the "coffin ships" bound for North America did not receive a warm welcome. They became America's urban poor and were quickly identified with disease, alcohol abuse and crime. However, these entry-level laborers helped build railroads, dig canals, mine coal, and foster the growth of cities, states and the nation. Many Irish went on to make significant contributions in the fields of business, education, industry, government, medicine, science, religion and the arts.Today, more than 44 million Americans claim Irish heritage. 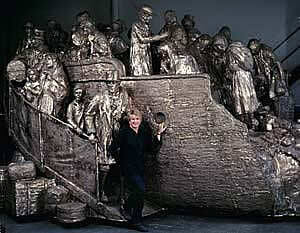 Glenna Goodacre and the "IRISH MEMORIAL"
In addition to honoring the memory of those who perished in the Irish Starvation, the "IRISH MEMORIAL" recognizes the indomitable spirit of the Irish who became an integral part of this nation's fabric by virtue of their contributions. 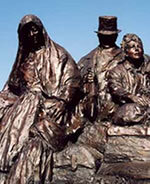 The monument also serves as testimony to the rich legacy of Irish-American people. It is hoped that the Irish Memorial will educate and inspire all visitors. This monumental bronze is designed as a dynamic arc filled with movement. Approximately 12 feet high, 30 feet long and 12 feet wide, the sculpture rests on a concrete plinth 2 feet high with the basic profile of a large wedge. 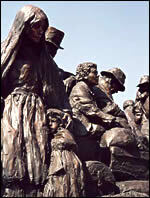 The monument's flow depicts the famine in Ireland, the people embarking for America, and the immigrants stepping onto American shores. The east end, suggests a landscape, portraying the misery of the Irish Starvation. In contrast, the higher end, suggests a ship, facing west as anxious immigrants dock in America and a number of figures rush forward in hope and anticipation. For this sculpture in the round, all of the figures are in period dress but they are loosely modeled and impressionistic. From more than 100 artists, Goodacre was chosen to sculpt the Irish Memorial not only because of her dynamic design but also because she best expressed the mission and objective of the memorial. 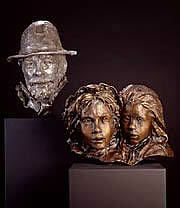 Alternate View of the "IRISH MEMORIAL"
Goodacre's ability to capture emotion in sculptural form has been honed over several decades of an award-winning career. For more than a decade, Goodacre has been a participant in the Art in Embassies program, exhibiting work worldwide. The most recognized of her completed public monuments is the Vietnam Women's Memorial in Washington, D.C. Goodacre has more than 40 bronze portraits in public collections, including sculptures of Ronald Reagan, Dwight D. Eisenhower, Greer Garson, and Scott Joplin. In 2000, Goodacre's rendering of Sacagawea, the interpreter for Lewis and Clark, appeared on the face of a new dollar coin issued by the U.S. Mint. 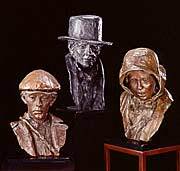 Detail of the "IRISH MEMORIAL"
An academician of the National Academy of Design since 1994 and a fellow of the National Sculpture Society since 1981, she has won many awards at their exhibitions in New York. Much earlier in her career, Goodacre studied in New York at the Art Students League. More recently, she received honorary doctorates from Colorado College, her alma mater, and Texas Tech University in her hometown of Lubbock, Texas. As part of an initiative in the Philadelphia school district, as well as in other school districts throughout the country, the Irish potato famine has been recently added to the history curriculum. Philadelphia's "IRISH MEMORIAL" gives a stirring visual presentation, coupled with substantial historical data, to complement the school curriculum. The memorial is truly an educational experience.